Side-Links Stop Plug From Breaking Open During Insertion, Ensuring Positive Action When Screw is Driven In. Screw Guide Stops Screw From Penetrating Sides, By Ensuring Positive Tracking Down Entire Length. 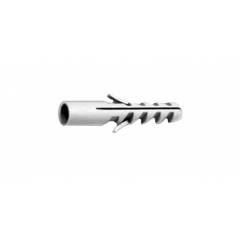 M-Teeth Combined with Side-Links and Screw-Guide, Ensure Entire Plug Face is Forced Against Walls of Hole, For Enhanced Grip In Soft Materials. Offset Block Profile Allows Plug To Hold Firmly Against Sides of Hole When Expansion Begins. The Wide Neck is Subject To No Expansion Pressure and Prevents Surface Damage To Tiles and Plaster. Can be Used with Wood and Chipboard Screws From 2.5 to 12 mm.